I've created my own custom leveled patch list for all the weapon mods I'm using and they're spawning fine, but I don't know how to get the mods to spawn with them as well. How do I get random weapon mods to spawn on the weapons? Some people probably don't understand why their weapons don't show up on vendors / raiders. 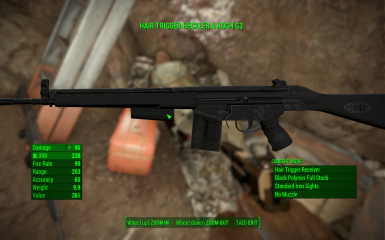 There are like 10+ quality weapon mods for FO4 as of today, and many of them conflict with each other. Having a patch for 2 of them is not sufficient. 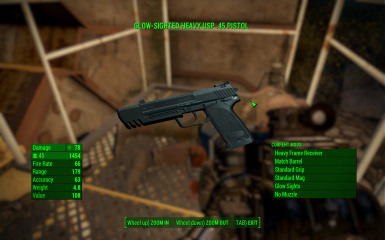 I think you should upload a merged patch for all these weapons, and/or explain in a few sentences hot to download FO4edit and create a merged patch for their weapon mods. I might do a super merged patch for all the weapons at some point. However, that would involve a lot of extremely fiddly/tedious work, which I would be obligated to maintain indefinitely into the future. This will be made worse as the original modders add/change their work, which has the potential to break my patch, requiring me to release new versions constantly. Then there's the issue with the weapons themselves. For example, the G3 weapon entry appears to be a copy+paste from the submachinegun entry, with modifications made afterwards. The best way that I would describe it is "hilariously broken", and getting everything to work was time consuming and annoying. Now imagine all of the issues of getting 10+ weapon mods to work together. I have a merged leveled list patch in my mods here: http://www.nexusmods.com/fallout4/mods/8574/? I haven't updated it to include some new weapons but I will very soon. stabcops already did that stuff. Open fo4edit, right click on any mod > other > create merged patch. done. The real question you should be asking is whether a merged patch will help you. xEdit isn't the greatest for merging lvld lists. You need to have a basic understanding of what you're doing before hand because you will need to fix any errors xEdit throws at you. xEdit wasn't built for the purpose of creating merged patches. It's a conflict resolver. Don't expect an automated miracle.